The AAA Fusion Title was a professional wrestling championship promoted by AAA in their brand AAA Fusion. Fenix was the first, last and only champion. He defeated Crazy Boy, Daga and Juventud Guerrera on March 17, 2013 in Plaza de Toros Monumental of Monterrey, Nuevo Leon. The AAA Fusion Championship was introduced at Rey de Reyes, 2013. The match to crown the initial champion was between Crazy Boy, Daga, Fenix and Juventud Guerrera. Everyone won a Four Man Elimination Match to advance to big final. 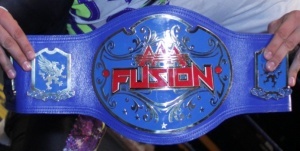 The AAA Fusion Title represent the newest AAA brand that began their tapings on September 2012. The tapings didn't last long, and the championship hung around until 2015 as a vestige of a failed idea. Fenix occasionally defended it on indy shows and AAA still acknowledged the title, but it was not used on TV. It was finally eliminated as part of a 10 man match on TripleMania XXII. This page was last edited on 3 April 2016, at 09:56.